The Town of Manteo wraps around Shallowbag Bay on the eastern side of Roanoke Island, part of North Carolina’s Outer Banks. Named the seat of government for Dare County in 1870, this waterfront community incorporated in 1899. In those early days, every store lining the waterfront had two doors - one for those coming by boat, and the other for those coming from the courthouse or one of the inns on Water Street. Today, county business still brings people to town, as well as many reminders of the island’s history, including the representative 16th century ship at Roanoke Island Festival Park, or the George Washington Creef Boathouse and Roanoke Marshes Lighthouse, part of the North Carolina Maritime Museum. Each summer, the town welcomes singers, dancers, and actors back to Waterside Theatre, where they perform the nation’s oldest outdoor symphonic drama, The Lost Colony. Weather is always a topic on an island, and in Manteo, the day’s weather report takes the form of signal flags flying from a restored US Weather Bureau tower. 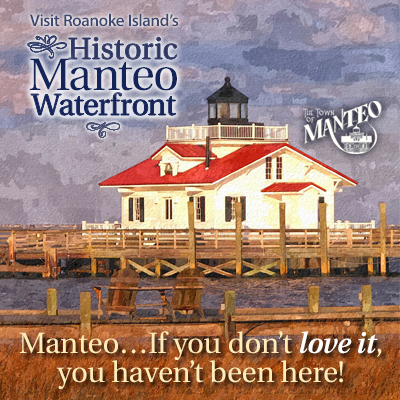 No matter the weather, there’s always something different to do in Manteo, and another reason to return. Maybe there’s a concert or art show or nature program that brings you back. First Fridays, Dare Day, July 4, Virginia Dare’s Birthday, Halloween, and Christmas are special times in the town for residents and visitors alike. But often it’s the everyday interaction with people that makes you pause, turn back, come again. You might meet an island native who traces his family back four generations. Or then you might meet someone from your own hometown.